This mango salad is not only delicious but easy to prepare and nutritious as well. There are many ways to prepare fruit salads. This salad has the nice sweet and sour flavor of the mango, crunch from the onion and almonds, tang from the tomato and the dressing. This is one of the best ways to use up the mangoes that are not sweet enough to go in shakes. Hope you will like it as much my family likes it. On a hot summer day, if you eat this fruit salad, you will feel full and yet light. 2-3 Tbsp of a healthy mayonnaise or Vinaigrette dressing. Put all the ingredients in a large bowl and toss well. Add the dressing and mix well to coat well. Transfer to a serving bowl. Chill for 1 hour and serve. Enjoy the lovely summer fruit salad. Mangoes are cultivated in frost-free tropical and warmer subtropical climates, although nearly half of the world's mangoes are cultivated in India alone. In fact in India mango is considered as the 'king of all fruits'. There are many varieties of mangoes available and the taste differs from variety to variety. Each variety has it's own peculiar taste, which just takes you on a heavenly experience. Especially during summer months, mangoes are eaten in abundance. Some households bring mangoes in bulk (50-100 kg at a time). Amazing, isn't it? The most common and popular ways to consume this fruit are making shakes, lassi, puree or eat as they are. In India mangoes are used in different forms. Listed below are a few common ways to consume mangoes. 1) Dried and powdered, known as mango powder or amchur - to be used in savory cooking. 2) Ripe mangoes are often cut into thin layers, desiccated, folded, and then cut into cubes. Known as 'aampapad'. 3) Mango lassi (mango smoothie using yogurt) is very popular way to eat mangoes. 4) Mango shakes are a delight anytime during summers - a chilled glass of mango, mixed with milk, sugar and ice, is good to refresh you. Yummy! 5) Mango chutneys can be made with unripe mangoes and taste delicious. 6) Mango pickle - one of my favorite pickle. Large jars of pickle are made during summers and consumed throughout the year, to give that extra kick to the food. 7) In Gujarat (India), aamras is a must with food. It is mango pulp mixed sugar and pureed. 8) Mango murabba is a kind of preserve, made from jaggery and mango. 9) Mango barfi - is a Indian sweet made with mango and milk. 10) Mango ice cream / kulfi are always a delight. 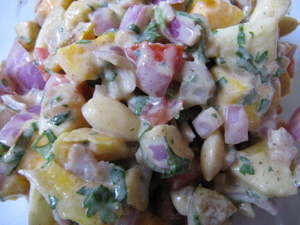 11) Mango Salad - this is not very common though.